Data and analytics leaders are pivotal in delivering strategic insights for digital business, and service providers are shifting gear to support them through a growing set of services and solutions. 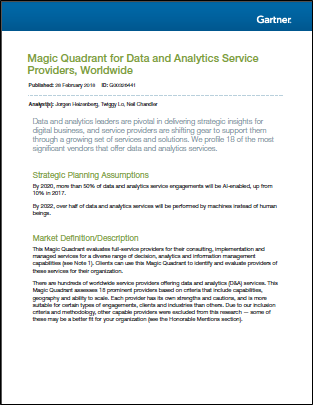 Gartner profiles 18 of the most significant vendors that offer data and analytics services. Learn more about our Data & Analytics services here.